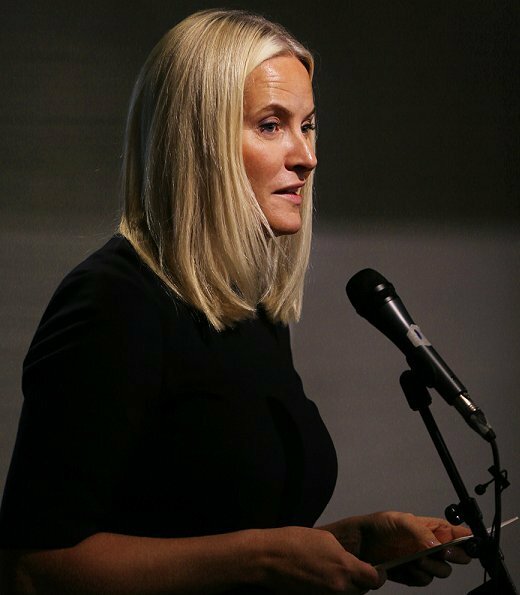 On October 18, 2017, Crown Princess Mette Marit of Norway opened a new Red Cross Centre for the return of former convicts to society. 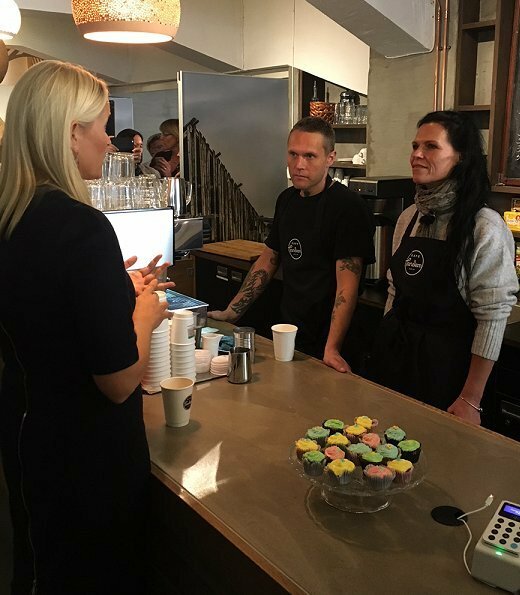 The Red Cross Centre cooperate with Oslo Municipality and the business community in order for previous criminals to have normal lives. The Red Cross centre offers various activities, work training and debt management assistance. There is also education for adults at the premises. I like it too. The simple style flatters her and the monochromatic dark look works well with blonde hair. I had to look at the shoes carefully. Are they brown? Not so good. This somber outfit is suitable for the gathering which, I am sure, reminds her of the murder of her stepbrother six years ago. Good for her to take this step to help those who have paid their debt and are trying to make new, productive, lives. Her hair is never nice. Same boring styling (or no styling ) always. Women can never win really. If she would make every day a special hair-do we would have soon another Maxima with really bad hair days and complain daily how poor her hair is looking. I myself appreciate quite a bit these ladies Mette Marit and Victoria, who do not have any daily hairdresser by the way, who have enough self-confidence to keep lover profile with their hair in everyday situations. Their hair is anyway always neat and combed. In special occasions they both have had really nice hair-does. Actually I have many times wondered do writers here have such a magnificent, flawless well done coiffure made by themselves what they wait for these royal working ladies to have.